N2Blast.com is the latest website and blog launched by leading Nitrogen Generator manufacturer, South-Tek Systems. The N2-Blast® - Corrosion Inhibiting System designed for Dry and Pre-action Fire Protection Systems is a compact system designed to generate high purity, corrosion inhibiting Nitrogen (N2) gas to maintain supervisory pressure. Wilmington, N.C., November 2011 - South-Tek Systems, the leading engineer and manufacturer of Nitrogen Generation technology, announces the launch of N2Blast.com, a website and blog dedicated to the N2-Blast® - Corrosion Inhibiting System for Dry and Pre-action Fire Protection Systems (FPS). 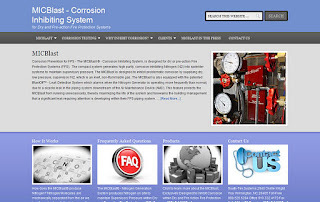 This new website is devoted to educating engineers, contractors, FPS managers and end-users about the causes of corrosion to sprinkler pipe systems, the dangers of such corrosion, and the solution presented by the N2-Blast® - Nitrogen Generation System. The N2-Blast® - Nitrogen Generation System was developed to inhibit FPS corrosion in Dry or Pre-action sprinkler piping by supplying dry, low pressure, supervisory Nitrogen (N2), which is an inert, non-flammable gas. South-Tek Systems engineers and manufactures Nitrogen Generation Systems for a variety of applications and for a range of purposes, including corrosion prevention. Corrosion develops as a result of unprotected metal coming in contact with both oxygen and water/residual moisture. Nitrogen gas works to inhibit corrosion by displacing any residual water left behind from hydrotesting as well as depleting the oxygen supply; both are necessary elements in the corrosion process. South-Tek Systems designed the compact N2-Blast® - Nitrogen Generation System specifically for the purpose of inhibiting corrosion within FPS. N2Blast.com is geared toward any owner/user of a Dry or Pre-action Fire Protection System. Architects and engineers, contractors, developers, building managers, and property owners can all benefit from the information and resources presented at N2Blast.com. In addition to specifics about the N2-Blast®, the website and blog also provide facts about corrosion, photos of sprinkler pipe systems affected by corrosion, and the benefits of using Nitrogen gas to inhibit the development of corrosion. "We are excited about the launch of N2Blast.com," comments South-Tek Systems' Catalog Division Product Manager Scott Bodemann. "We want the chance to educate FPS users and managers about the threat of corrosion and to present an effective, affordable system to help inhibit the problem. Our new website and blog is a valuable resource about FPS corrosion in general as well as the N2-Blast® - Nitrogen Generation System in particular." Visit the new website at http://www.N2Blast.com to learn more or contact South-Tek Systems directly at 888-526-6284.